Just one shot to tell the story of Malory and AJ’s wedding week outside of Siena. This image of the long, rustic and plentiful table tells not only of the luxury and intimate charm of the villa, the floral design and the lighting, but also of the convivial atmosphere of the night to come, the conversation and celebration to follow. “…After being together for 9 years, and living abroad for 6 of those, getting married was something we did for our families more than for us. 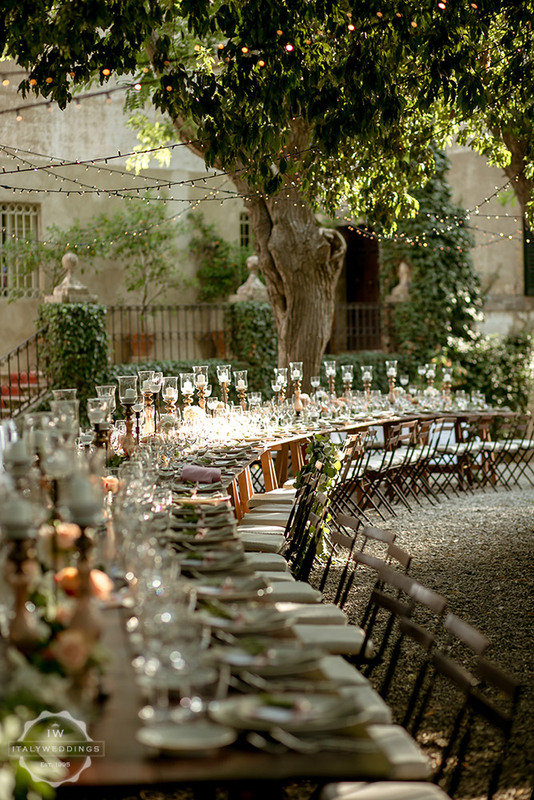 We had a choice between a 300 person wedding at home in the US, or 60 of our favorites in Italy. It wasn’t really a difficult decision…! For our wedding, we wanted a week full of family, friends, delicious food, fine drink, and unlimited excuses to live la dolce vita. Our wedding week consisted of a Welcome Dinner, trip to the Palio di Siena for the wedding party, Pizza Party by the pool, Masquerade Rehearsal Dinner, Wedding, and a Recovery Lunch. Having a week to spend time with family and friends took all the stress away from the Wedding Day, and instead was the perfect culmination to the most amazing week of our lives shared with the people we love the most. Everything about our time in Italy was all we could have dreamed of. It would not have been possible without Martina and the Italyweddings team. From the very first email we knew we were in good hands. We wanted to change the traditional way people get married by walking ourselves down the aisle, having a wine ceremony with our brothers as officiants, as well as numerous other small changes to the usual paradigm. Martina embraced all of our ideas with enthusiasm and we tested all of her planning potential with 5 catered events over 6 days. She executed it all perfectly, helping us plan out a week of the best of Italy for our guests.